Ahoy Matey! 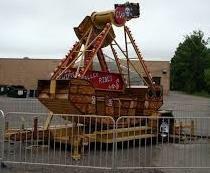 Batten down the hatches get ready to climb aboard the Pirate’s Revenge. A Bouncing Adventure's newest mechanical ride is ideal for festivals, corporate events, picnics, and school events. Popular at many fairs and amusement parks, it's a great fundraiser item that can move about 250 people per hour. The pirate ship consists of an open 12 seats ship that swings back and forth, subjecting the rider to various levels of angular momentum. The height of the ship’s swinging is controlled by our operator, so the ride can be geared toward the little ones or pushed higher for older kids and adults. Includes: the ride, safety fencing, and 1 attendant.